The history of the pioneer troops goes back to antiquity. To this day their task is to support the other branches of service by facilitating their mobility and endurance, while hampering the mobility of enemy troops. In the German Empire, from 1871 the pioneer troops of Bavaria, Saxony and Wurttemberg had to adapt to conform to Prussian norms although the Saxon pioneers still retained a completely different uniform, giving them a unique appearance within the Imperial Army. The Grand Duchy of Baden provided its own pioneer battalion within the Prussian Army. At the end of the 19th century, advances in science and technology led to the formation of new branches of service, known in the German Empire collectively as the ‘Verkehrstruppen’. These included railway, telegraph, motor and airship formations, as well as the newest branch, the aviation troops. The train was primarily responsible for keeping the troops supplied with ammunition and special equipment as well as provisions. Covers the contingents of the Kingdoms of Bavaria, Saxony and Wurttemberg as well as the Grand Duchies of Baden and Hesse. 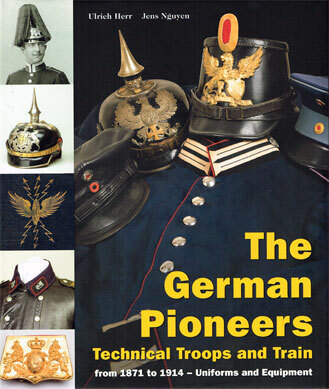 You will find in the chapters of this book summaries of the developmental history of the German pioneers, technical troops and train formations for the period between 1871 and 1914, followed by the specifics of their headgear, uniforms and equipment. Contemporary photographs and numerous items of uniform illustrate the equipment of the pioneers, technical troops and train that are the subject of this book. Excellent! H/C. 512p.